There has been much talk and heated discussions this past couple of weeks on both losgigantes.com forum and tenerife forum I won’t repeat the discussions but anyone interested can catch up through these links. 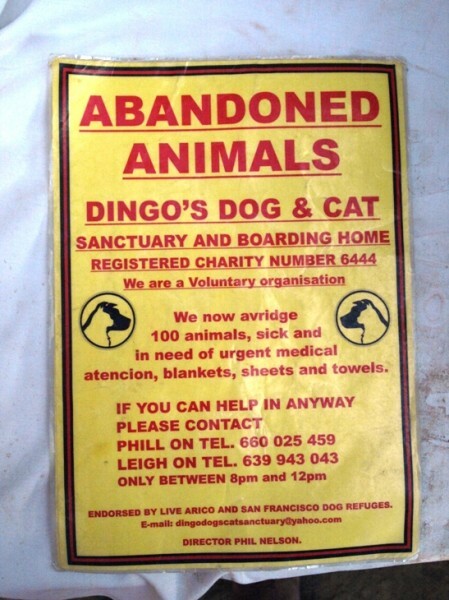 Basically there were 2 questions:- Are Dingo Dogs a registered legal Charity, with fiscal and inscripción numbers, and should they, as they are based in Guia De Isora, fundraise in the Santiago del Teide area, where there are already 2 registered animal charities. These 2 questions have triggered off one of the most controversial strings on the forum. At the invitation of Andy, president of Dingo Dogs and Phil, the director I was invited to the centre to see for myself the shelter and meet all the dogs in their care. All they requested of me was an unbiased report, I could take as many photos as I wished, and no area of the sanctuary was out of bounds to me. I then thought it a good idea if Judith Noble, from the Santiago del Teide Branch of Asociación San Francisco de los Animales, came with me because she had never visited the shelter. That was no problem to Phil. 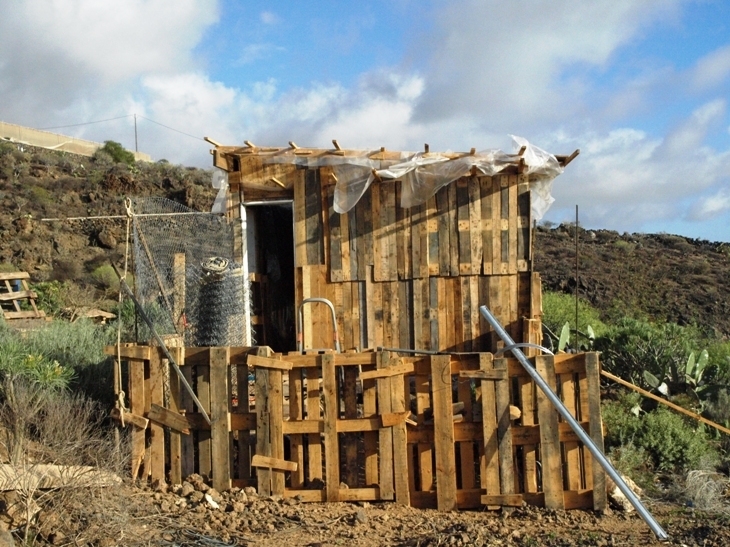 The shelter is located quite a way up the Cuevo del Polvo road. I would have had problems finding it but Andy met us and we followed him. As we pulled up at the shelter the dogs were so excited at having visitors that we were unable to talk for a while until they settled down. Phil welcomes visitors at anytime but it is best to telephone ahead and give him warning. The reason being is that the majority of the dogs have complete run of the large grounds. When visitors arrive the dogs get excited which can lead to a punch up between them. Phil fastens the possible troublemakers by their leads to their respective kennels to keep order in camp. Once we had been introduced to Phil we were then introduced to every one of the 75 dogs that are currently being cared for in the shelter. Every dog has a name and they all clearly adore him – except one which must have been badly mistreated by a man in the past because she would back away when he went near her and yet she came to both me and Judith. Almost every dog has a sad history of abuse or neglect. Some dogs had been brought to Phil to look after while their owners were on holiday – sometimes the owners never returned, leaving a very sad bewildered dog and another mouth to feed– not to mention vet bills. 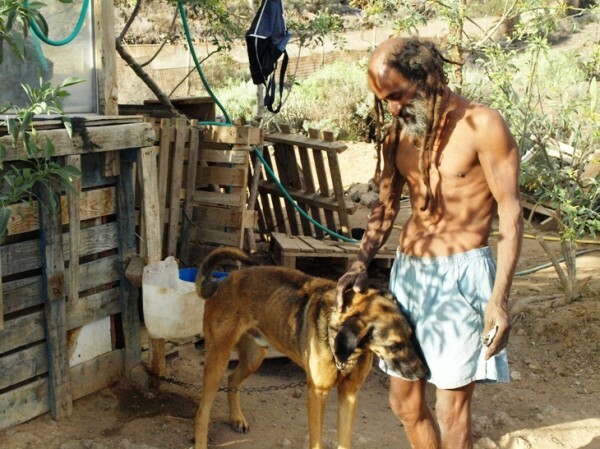 On occasions they have had over 100 dogs to care for, that’s some food bill every day. We were told of the mostly horrific histories behind many of these dogs and it left me so upset. Six puppies abandoned in a box at the roadside (one of them is pictured left) Judith is used to hearing tales like this so she was a bit more prepared than me. I have stared at a blank page on my computer screen for quite some time, not knowing where to begin. There was also the problem of someone throwing poisoned meat into the grounds. 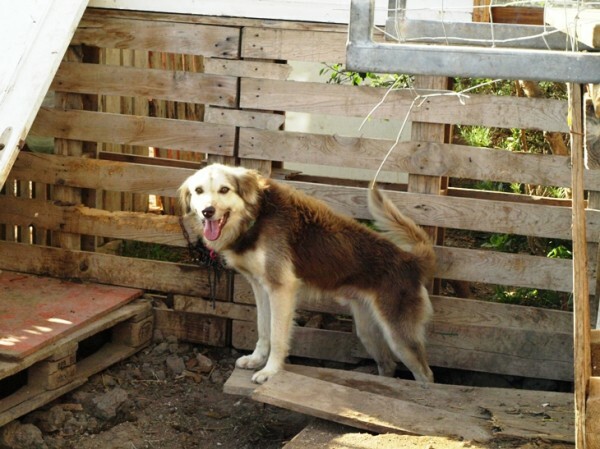 Several dogs died and the ones that survived added yet more cost to the vet bills. Now to the happier part of the visit. Every dog was healthy and well fed. Some recent arrivals were still on the skinny side but were well on the way to being 100% fit. 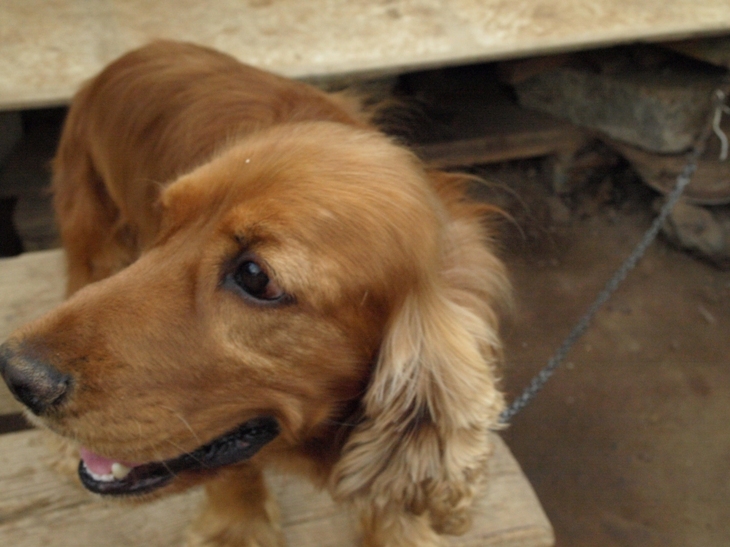 Every dog was so pleased to see us and it was very hard to give our attention fairly. There are so many that would make lovely pets if only they could find a nice home. Phil does make every effort to find good homes for the dogs but if the situation arises where the arrangement does not work out he will take the dog back. We were also taken to a part of the sanctuary where the lager louts (Judith’s expression) are kept. Big dogs that are fine with people yet couldn’t be let loose because they fight with others. Phil has rigged up a slide line and shade so the dogs can exercise. Again each dog was pleased to see us and not at all aggressive. Phil and Leigh live at the sanctuary. 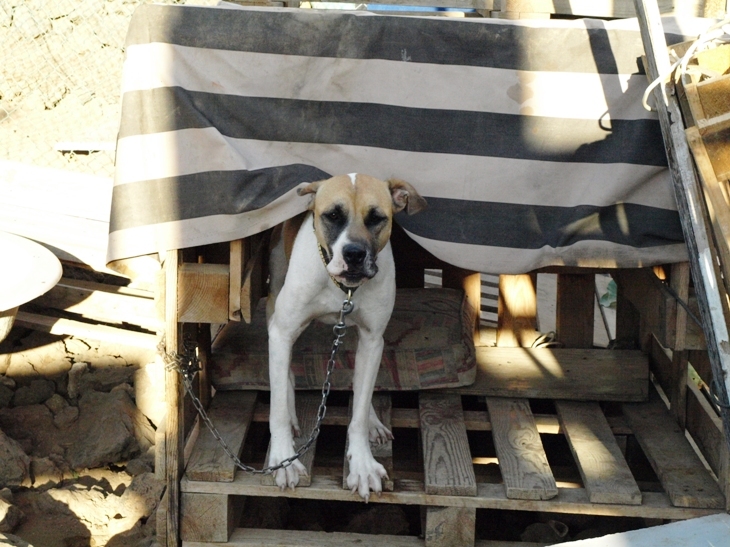 Their home, their life, their work is 100% for the dogs. It is clear that all funds go towards the dogs. Phil takes time out from the shelter 2 evenings a week to busk in Las Americas to help with the bills. Their homes, like the dogs, are all made from wooden pallets, donated wood, mattresses etc with only the very basic essentials needed to live, and home comforts – they’ve no time, or money for any of that. There are several old cars which have been collected and turned into dog kennels. 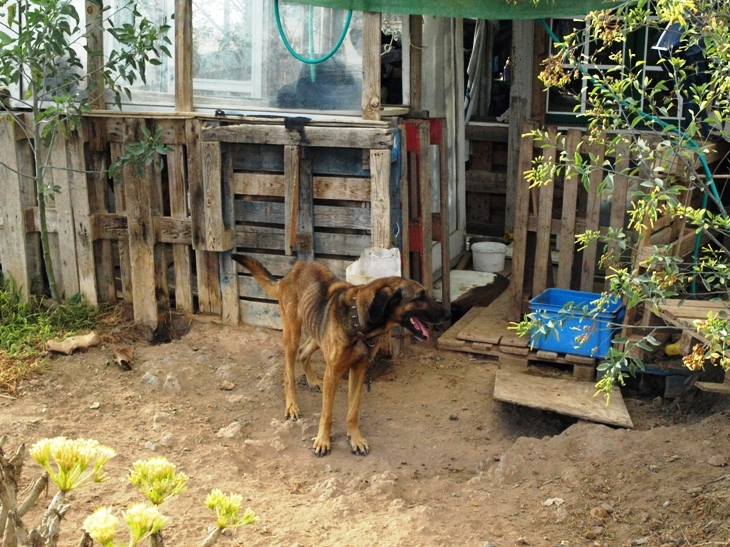 Very slowly better kennels are being made and there are now several volunteers who are helping with the work. 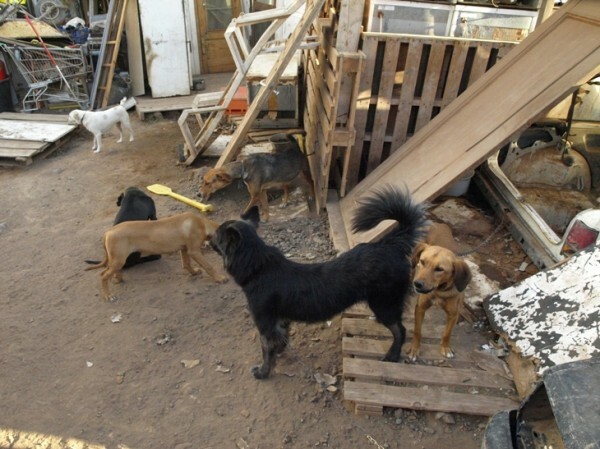 The problem is that after dog food is bought, vet bills are paid there’s very little left to build better kennels. The shelter (shown right) is being built by Alex and her friends. 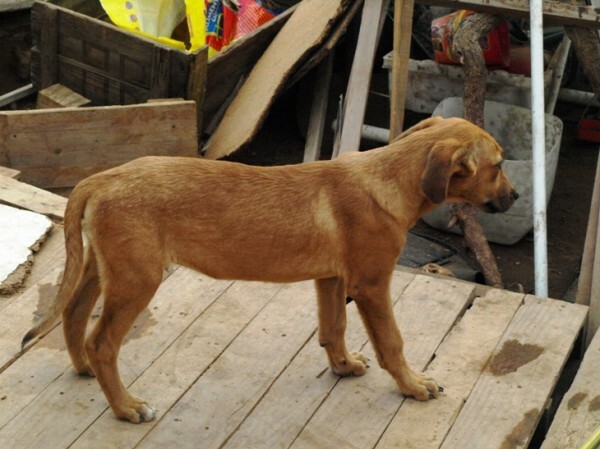 She is returning to the UK with her family and is leaving her dogs with Phil until the necessary quarantine time has passed before she can fly them to the Uk. The fundraising night at Tipsy Terrace was her way of thanking Phil. Phil insisted on showing me his paperwork and his Charity number 6444. Who am I to inspect his paperwork? I know nothing of the laws regarding charities and animals, but he does have a folder kept by his gate for anyone who wishes to look at it. Phil also informed me that his information is registered at the charity centre in Santa Cruz – sorry can’t remember the Spanish name. However, it’s not for me to pass judgement but I’m sure if he had been doing anything illegal the Guardia would have shut him down years ago. As to when and where they can fundraise, the second of the questions. Each charity has a defined area stated in their statutes. 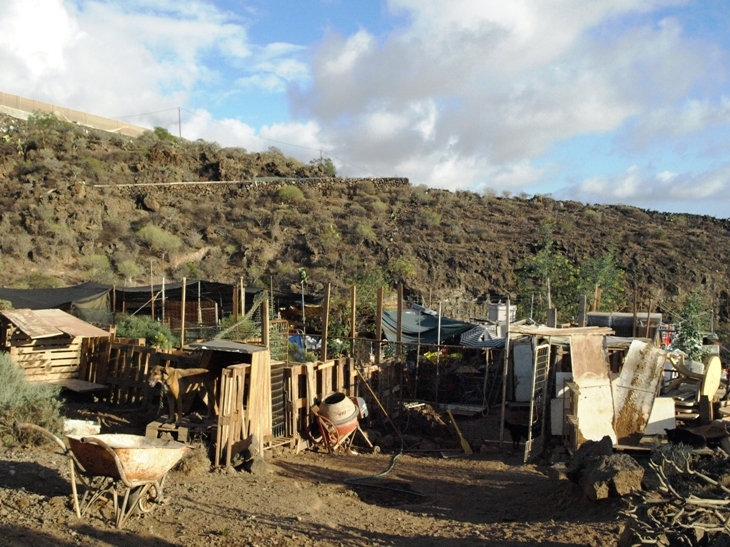 I did not know this and I did not ask the question yesterday, however Councillor Gerald has confirmed that if they wish to fundraise in a private bar anywhere in the Santiago del Teide area then that is a private matter between the Charity, the bar owner and whoever wishes to support them. If they wish to have a fundraising evening in a public place i.e. Los Gigantes square then they have to apply for a licence from the town hall. Their paperwork for credibility would be asked for if they were not already registered with the town hall. (I can confirm that whenever Santiago del Teide Branch of Asociación San Francisco de los Animales or the Lions put on a charity event in a public place these licences are always applied for). Is my write up unbiased? Not really, I’m soppy with animals and I’m still deeply upset that there are so many homeless animals on our doorstep, but they arn’t really homeless I tell myself they have a home with Phil. I’ll be back to the rescue centre before the end of the week with the biggest bad of dog food that I can buy. When I told my mother in law the story she handed me some money and said “make that 2 bags”. Thanks for that Sheila, a lovely written article, will it be enough to silence the critics? I hope so but i won’t hold my breath! Many thanks for your efforts, I can imagine how distressing it much have been I certainly will have no qualms at all in contributing to such a worthy cause. On a daily bases I like to keep in touch with what goes on in Los Gigantes via the losgigantes.com web and find 90% of the postings interesting and helpful. The other 10% do nothing in promoting Los Gigantes and spoil such a good website. Thank you. I was moved by your words & photos. I will try to do what I can to help. Thank goodness for people like Phil. Thanks to Dolly and Judith for giving up their time to (hopefully)resolver the issue and put to rest any suspisions people had about the legitimacy of the work Dingo Dogs do. 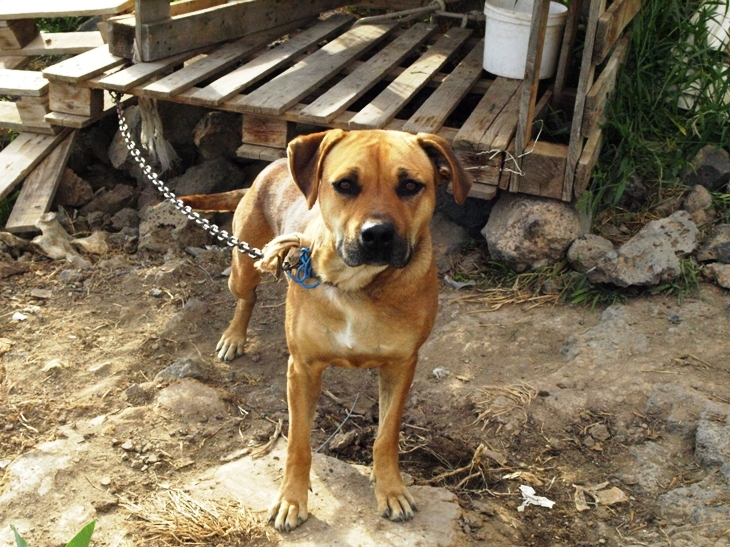 Keep up the good work all involved in ALL animal charities on Tenerife, you are all doing a brilliant job. Hey, thanks for the blog article.Really looking forward to read more. Awesome…. I value the article post.Thanks Again…. Looking forward to reading more. Great article post.Really thank you! Great…. I think this is a real great article. Awesome…. Thank you for your blog article.Really looking forward to read more. Great…. A round of applause for your article.Really thank you! Cool…. I value your blog.Thanks Again. Would like more….